Former Libyan intelligence chief Abdullah al-Senussi was one of the closest confidants of Libya's former leader Col Muammar Gaddafi. Senussi was sentenced to death in July, but the verdict is now under appeal. Senussi rose from relatively lowly origins to become one of Libya's most powerful individuals. It was his marriage to Gaddafi's wife's sister in the 1970s that brought him into the ruling inner circle and he took up various roles including deputy chief of the external security organisation. He is also said to have been a close adviser to Saif al-Islam Gaddafi, the former leader's son, according to leaked US embassy documents. Wanted by both the French authorities and the International Criminal Court (ICC), he fled Libya after Gaddafi's downfall and was arrested as he flew into Mauritania from Morocco on a false passport in 2012. The ICC had issued arrest warrants in 2011 for Senussi, along with Gaddafi and Saif al-Islam, for crimes against humanity committed particularly against demonstrators in the eastern city of Benghazi at the start of the Libyan uprising in February 2011. Observers considered him more of an executor than a mastermind behind the activities of the Gaddafi regime. He was nicknamed "the butcher" because of his reputation for brutal behaviour. In 2012 Senussi was deported from Mauritania to Libya. Successive Libyan governments insisted on prosecuting Senussi on home soil. The ICC ruled in 2013 that Libya was able and willing to prosecute Senussi and that it was no longer necessary to send him to The Hague to stand trial. 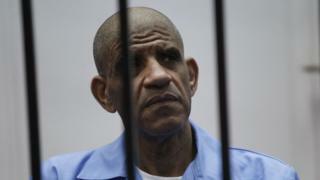 Senussi was tried along with 36 other Gaddafi-era officials and in July 2015 was condemned to death by firing squad along with Gaddafi's son Saif al-Islam and seven other former officials. The death sentences still need to be confirmed by the Supreme Court. Despite the Libyan government insisting they could conduct a fair trial, many believe the trial was tainted by the political unrest in the country. The trial had no witnesses brought forward, and no evidence was presented or debated in court. Intelligence agencies believed Senussi's supposed intricate knowledge of the workings of the Gaddafi regime could shed light on some of its most notorious acts. But according to former Justice Minister Salah al-Marghani, who was in power when the trial began, Libyans had been "deprived of finding out the truth in a fair trial to judge an era of severe tyranny". Senussi has been accused of other human rights abuses, including his implication in the massacre in 1996 of more than 1,000 inmates at the Abu Salim prison in Tripoli. He is alleged to have given the order to guards standing on grated ceilings above the inmates to fire down on them, after riots broke out over demands for better food and sanitary conditions. Before his arrest he had been unable to travel abroad freely since he was convicted in absentia in France in 1999 for his role in the bombing of a French UTA passenger plane in 1989. The plane blew up over the West African country of Niger, killing 170 people, many of them French. Analysts had suspected Senussi has knowledge that could help the US and UK authorities establish the full facts about the 1988 Lockerbie bombing, in which 270 people died. The Pan Am 103 flight exploded above Lockerbie, in southern Scotland. Scottish prosecutors are believed to have recently identified Senussi as one of two new suspects in the ongoing investigation into Lockerbie and have requested permission from the Libyan authorities to interview him in Tripoli. They believe the two suspects acted along with Abdelbaset al-Megrahi - the only person to have been convicted of the atrocity. Senussi is thought to have recruited Megrahi, who died in 2012. Both Megrahi and Senussi were members of one of Libya's biggest tribes, the Magarha. The former intelligence chief is also thought to have information about Libyans kidnapped and assassinated in Europe and elsewhere during Gaddafi's rule, and the financing of terrorist organisations, especially in Africa. He has also been linked to a plot to assassinate Saudi Crown Prince Abdullah in 2003. And he is said to have overseen the building of a secret nuclear plant in Libya's southern desert, the whereabouts of which has never been revealed. He was also on a US treasury department blacklist of senior Libyan officials whose assets can be frozen if they are found inside US jurisdiction. He is said to have had extensive business interests, like other members of Libya's political elite.